"Moodle's mission has always been to help educators improve learning with open, accessible tools to use as they wish," said Martin Dougiamas, Moodle Founder and CEO. "Our Moodle Partners take care of many thousands of institutions and individuals worldwide with second-to-none services, and through their royalties they continue to fund Moodle in achieving our mission. Today we launch MoodleCloud, for teachers and trainers with small needs and even smaller resources to quickly and easily set up their own learning environment direct from the people making Moodle. 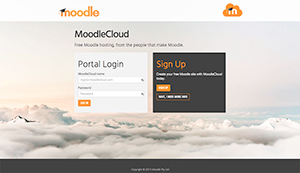 Education is the foundation of nearly every important thing we do on this planet, and I'm proud that Moodle is able to offer alternatives for everyone from the largest university to now smallest individual classroom with MoodleCloud." According to the company, MoodleCloud site administrators can manage multiple courses, add content, enroll users and use Moodle's collaborative learning activities within the learning environment. Since it's a cloud service, MoodleCloud automatically updates to the latest Moodle release. Full support enabled for the Moodle Mobile app. For more information, visit the Moodle site.